It’s not only the Chinese and North Koreans who need some work on their Photoshop techniques. Check out this doozy from either the race organizers or the bird park. Why is that bird flying straight for Brad (who isn’t even in the race)? Hired by Team Saxo Bank, is my guess. Anyway, check out this stage today if you have a chance, plus some nice, big mountain stages starting tomorrow, including Alpe d’Huez on Saturday. Steephill.tv has all the usual live-streaming options. 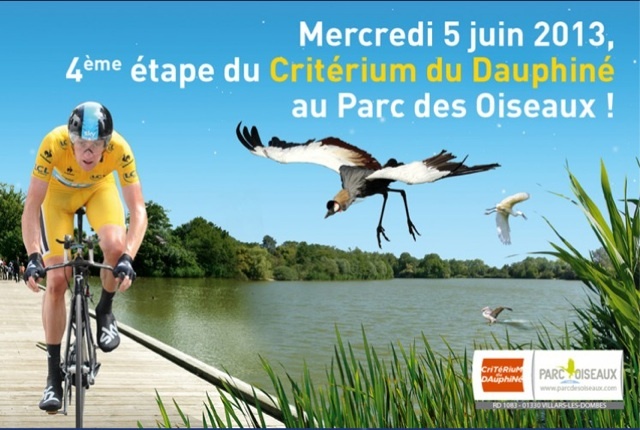 This entry was posted in Cycling and tagged criterium du dauphine 2013. Bookmark the permalink. its getting harder to watch Pro cycling …with the latest Sh*t form Deluca and Santambrosio at this years Giro…super strong smell from Supermario all over That….And again today the laurels are out for Stuart O Grady who announced he will retire after the tour…thats the pup who won Paris Roubaix with CSC at the height of the dope fiend era………and not a word..
will it ever get real? In answer to your question: apparently not. Hi Roan – I hear you and it’s always disappointing whenever we see a rider get busted for PED’s. But what sport would you watch? Cycling probably airs their dirty laundry more than most sports, hence cycling’s tardy reputation for cheating, but we know that other sports simply turn a blind eye or shuffle their cheats away from the general public. I know there will always be cheaters in the pro ranks because of the money involved, but I also enjoy the entertainment value of pro cycling, which is what draws me as a spectator. As a friend of mine once said, “let the mutants race”. I think that bird is going for the back tyre. Definitely on someone’s pay roll. It seems bent on destruction of some sort, no question.